Keyboard shortcuts are supposed to provide quick access to frequently used menu commands. But honestly, how many shortcuts do you know by heart? KeyCue helps you to use your Mac OS X applications more effectively. Just hold down the Command key for a while and KeyCue comes to help and shows a table of all currently available menu shortcuts. When you have found the desired shortcut in the KeyCue table, just type it and continue working as usual. 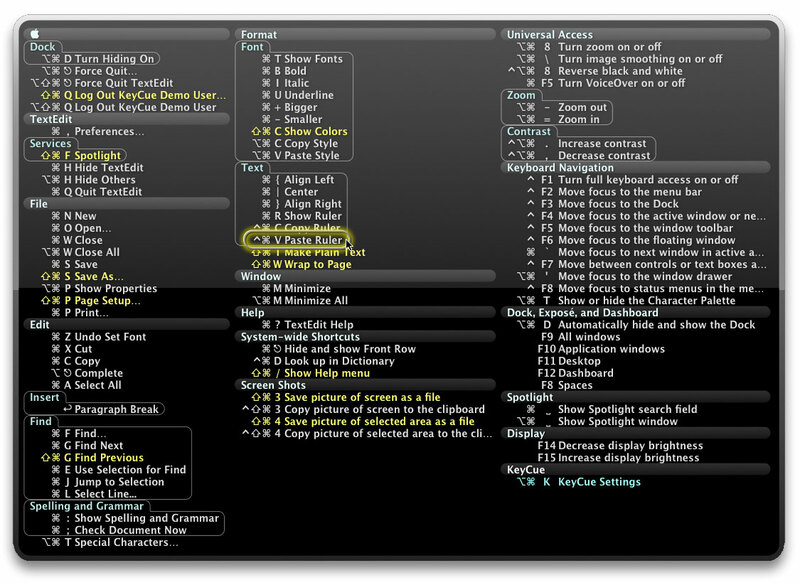 KeyCue are supposed to provide quick access to frequently used menu commands. ...... Over time, you will automatically remember frequently used shortcuts and start working more efficiently. KeyCue gives you an instant overview of the overall functionality of any application, plus lets you automatically start working more efficiently by making use of menu shortcuts. The more shortcuts an application offers, the higher KeyCue's value. Click the thumbnail image above to see KeyCue showing Textmate's shortcuts in full size. * Get an instant overview of all menu shortcuts in any application. * Simple to use: just press the command key to see the menu shortcut table. * Clickable shortcuts let you execute any shortcut instantly by clicking it. * System-wide hotkeys made visible. * Different themes for customizing the appearance of the shortcut table. * Instant access to the KeyCue settings window by means of an extra keyboard shortcut. Qweas is providing links to KeyCue 6.0 as a courtesy, and makes no representations regarding KeyCue or any other applications or any information related thereto. Any questions, complaints or claims regarding this application KeyCue 6.0 must be directed to the appropriate software vendor. You may click the publisher link of KeyCue on the top of this page to get more details about the vendor.